Every language has its beautiful words, but Italian takes the cannoli. Listening to someone speaking Italian is like listening to a song. It’s a language of love, emotion and passion. No surprise, right? Italians know beauty—Italian art, architecture, landscapes and, of course, language, are all captivating and alluring. You can capture this Italian beauty in your own speech by mastering some of the many musically multisyllabic words in the language. But first, you’ve got to get the pronunciations right! 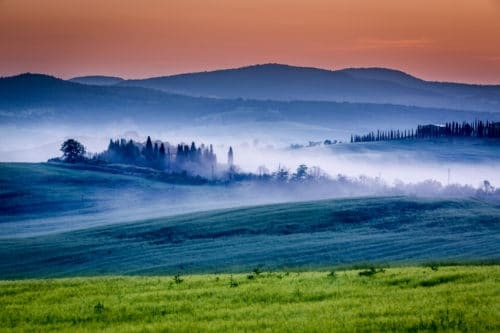 In this post, we’ll show you 10 of our absolute favorite beautiful Italian words, plus pointers on how learning them can boost your overall pronunciation skills. 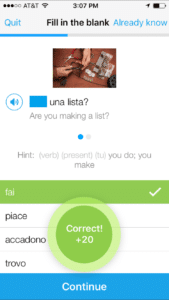 Italian is a phonetic language that can be easy to master once you learn the rules. However, while some of the pronunciations are simple and familiar to English speakers, some will feel strange or difficult to utter. But not every sound is that easy. Sounds like gli (moglie/wife), gn (agnello/lamb) and the rolled r (marrone/brown) can take a lot of practice and patience to master. 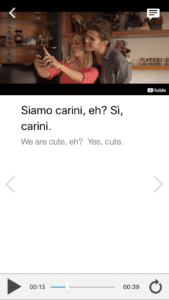 So where can you learn proper pronunciations for Italian words? Italian TV shows and movies or English programs with dubbed Italian audio are great for hearing proper pronunciations and repeating them. Italian music is also a fun way to practice. Learning to sing along with some great Italian songs will help you nail your pronunciations and even expand your vocabulary! There are endless online resources for practicing your pronunciation. 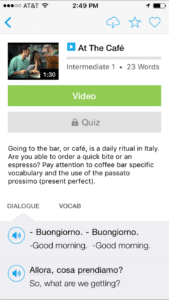 Most commonly used is YouTube, where you’ll find many different channels dedicated to learning, practicing or listening to Italian. FluentU is a particularly useful resource for hearing authentic speech in various languages. How do you describe the sky on the most beautiful days? Azzurro. Quite possibly the most beautiful word for a color in any language, azzurro is the Italian word for “blue.” Just saying the word can bring to mind a bright, sunny day. The double z makes a ts sound, much like in pizza (one of the best Italian foods!) and the double r lets you practice rolling them. This fun-to-say word is one to pull out when you order soup. Cucchiaio is the Italian word for “spoon.” It may look like an intimidating word, but it’s easy once you know the rules! The first c comes before a u, meaning it’s a “hard c” and it has a k sound. A c (or in this case, two) followed by an h is also hard. To break this word down phonetically, you would say “kooky-i-o” with emphasis on the i. Not so intimidating now, is it? A great exclamation for when you’re frustrated, basta is an Italian word for “enough” or “stop it!” A shortened version of the word abbastanza, which also means “enough,” basta is the word you use when you’re done dealing with something. Whether you’ve added just the right amount of ingredients to a recipe, or you’ve reached the end of your patience, basta is the word to say (or yell!) to put a stop to something. Basta is easy to pronounce because it’s just like pasta! Just say it with a little more vigor and you’ll be spot on. The great thing is that when you need a second to think, your allora can be stretched out a little. You can hold the long, rounded o for a beat or two, and when you’ve finally brought your next word to the tip of the tongue, you can finish with a soft rolled r and a short ah. It’s always great when a word sounds like its meaning. Much like the harsh, rolled, double r suggests, arrabbiato means “angry” in Italian. Food is an important part of Italian culture, so it’s no surprise that some of their beautiful words would pertain to food. Scarpetta is the bread that’s used to sop up the last morsels of a delicious sauce. It comes from the phrase fare la scarpetta, meaning “to make a little shoe.” This refers to the shape of the bread when it scoops up the sauce. Scarpetta is another word that helps you practice short r rolls, which are referred to as a “flap.” It’s very similar to pronouncing a d in English. Follow that with a brief eh sound and a strong stop with the double t and you’ll sound like a local in no time. Just remember, you only fai la scarpetta once you’ve finished your pasta! Many languages have words for complex situations that English doesn’t have. Culaccino is a perfect example of this. This is the single word Italians use to describe the ring left on a table from the condensation of a cold glass. Just like cucchiaio, this word starts with a hard c. Unlike cucchiaio however, the last c comes before an i, giving it a soft, ch pronunciation. Think of how you would say cappuccino ! It’s midday, the heat of the day is at its highest and you find yourself seeking a nice spot of shade to relax in and escape the harsh sun. Another example of a complex situation boiled down to one word, this entire scenario is the meaning of the verb meriggiare. In Italy, most shopkeepers close during lunchtime, because loro meriggiano (they’re resting)! This is one of the easier words on the list to pronounce, despite the double soft r rolls! Remember, Italian is a phonetic language, so this word is pronounced the same way that it’s spelled! Literally, mozzafiato means to cut off one’s breath. This is a good one to know when you go to Italy, as you’ll find most of the landscapes and scenery to be mozzafiato ! This word is another phonetically simple one. Most English speakers will associated mozza with cheese. It has the same ts sound from the double z as pizza. Fiato has a long a, giving it an ah sound. The t is the same as is used in English, except without an aspiration (that little breath you let out when speaking hard English consonants). For such a beautiful word, struggimento has an artistically tragic meaning. The short translation is “yearning,” but it’s really more akin to a harrowing mix of sadness and yearning. Another word whose definition seems to match its sound, struggimento sounds beautifully sad when said aloud. Combining the t and rolled r can be a bit of a stumbling block, but with practice, you’ll be able to say them together seamlessly. Once you tackle that trick, you’re golden! The rest of the word is said phonetically: “ooh,” “gee” and “mento.” With a bit of practice, you’ll be able to articulate this complicated feeling more easily than you can explain it! The Italian language is magical. It flows like a song. This list is just a small sample of the beautiful words Italian has to offer. With pronunciation practice, in no time you’ll be saying these words (and all kinds of other beautiful Italian words) like a local!